With the pale light of morning, Christmas Day filtered into the chill of an Ogaki apartment. In a corner of the living room, lights twinkled on a small tree displaying a few ornaments that had eluded the reach of tiny, exploring hands. Beneath the tree lay a mound of Daiso gifts, purchased with an allowance of one thousand yen and wrapped with the truest of intentions. The family--a brother and sister reunited after months of separation along with their spouses and children--huddled around the kotatsu eating a Christmas dinner of ramen with chopsticks. 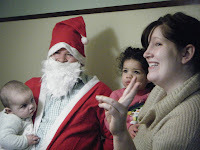 After dinner, the brother pulled on a santa suit (unintentionally frightening the children) and passed out the gifts. Soon the festivities were punctuated with oohs and aahs at the treasures garnered from the Daiso. Once the gifts had been admired properly and the colorful wrapping papper cleared away, the family once again settled around the kotatsu. This time to watch A Charlie Brown Christmas. As the strains of "Christmastime Is Here" filled the chilly air, the sister felt a warm glow in her heart from being with family once again. The brother smiled and thought that this day had been worth traveling halfway around the world for. Pet Milk Project -- "The Stranglehold"
The long awaited release of the Pet Milk Project has finally arrived! Conceived by Kelli Burton, this collaboration of writers, artists, and musicians culminated in a literary magazine, art exhibit, and CD that was unveiled tonight at the Arts Place in downtown Lexington, Kentucky. The event was well-attended. In fact, all the copies of the magazine and accompanying CD sold out before the end of the show. 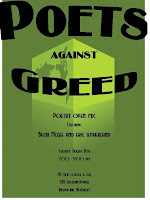 Poets Against Greed was a success! Several poets showed up to read their work and we had an awesome night of poetry. Battling stuttering and nervousness, I managed to get through my first reading with dignity and now I can't wait for the next one. Eric Sutherland's performance was inspiring. I say "performance" because his poetry reading is its own art form. I'm so glad he was able to come down from Lexington and join us. One of the poems I read was just written today and is still in its rough draft stage. It is called "The False Savior." and crawling up the shore. I arise from my bed. When going through the set-up yesterday, I had to choose a name for my blog. I sat there staring at the screen unable to think of one. So I decided to look at some of the poems I had posted on myspace for inspiration. In the archived poems, I found what I was looking for and "Versions of Chai" became the name of my blog. After over a year of being wrapped in layers of mental cellophane, one of my good intentions will finally see the light of day. Next Tuesday night, August 12th, I am hosting a poetry open mic at My Time Coffee & Tea, a Richmond coffee shop. 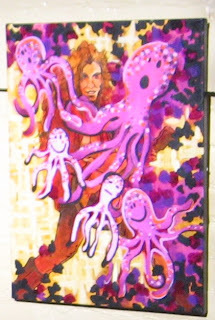 To the bewilderment of many, I am calling it "Poets Against Greed." Why the unusual sobriquet? First of all, I thought that "poetry open mic" was a little too boring. Secondly, I believe greed to be the root cause of most of the problems in our society and have made lambasting it the theme of a few poems. Lastly, I'm hosting it so I can call it what I want. It looks good on the flyer anyway.